Image caption Celtic has published images of the proposed development. Celtic have unveiled plans for a hotel and museum complex next to its stadium. The club released images of the proposed development, which could also include a ticket office and retail store. It announced plans to make a proposal of application notice to Glasgow City Council. 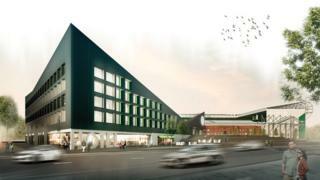 The hotel would be based on London Road, outside the main stand of Celtic Park and close to the Emirates Arena. A club statement said: "The application is part of Celtic's long-standing masterplan for the area, a vision which aims to deliver benefits to the club and our supporters and allow further regeneration of the east end of the city, something to which we are totally committed. "This application represents only the first stage in this process. It is important to emphasise that considerable work and investment over a number of years would be required to bring this project to fruition. There would be a number of challenges to overcome to complete a development of this scale. "Celtic aims to be a world-class football club in everything it does. We are pleased to have made significant investment in recent years to develop the stadium and public realm area for the benefit of our supporters. "Any further development of this kind would be a hugely positive step for the club, for our supporters and for the local community." The area outside the stadium was redeveloped ahead of the 2014 Commonwealth Games when the former London Road Primary School building was knocked down and a new 'Celtic Way' walkway was built. The latest plans were first mooted ahead of the 2014 building work.